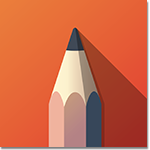 SketchBook® drawing software helps digital artists and designers capture ideas and refine concepts with a professional-grade toolset and an intuitive user interface. This product is only for Students and Educators on their personal devices. For deployment on school labs, please go to SketchBook for Educational Institutions. Now that you’ve obtained the access to SketchBook for Students, please download the app and follow the activation instructions.